Around AD 120, the Legio IX Hispana (or Hispania) “disappeared.” Its last known posting was on Hadrian’s Wall in northern Britain, and a legend has grown up that it was ordered on a punitive expedition against the Picti beyond the Wall and was lost campaigning against them. Numerous authors have exploited our lack of certain knowledge to speculate about what might have happened – from getting transported to alternate worlds (Codex Alera series) to less fantastical versions (The Last Legion), including this novel. Alas, historians are notoriously unromantic (at least modern ones) and demand annoying things like evidence, and the latest evidence would seem to indicate that the Ninth was destroyed in either Judaea or Parthia in the 130s and not reconstituted. 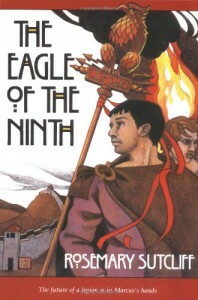 If I had read The Eagle of the Ninth when I was 13 years old and still blinded by romantic depictions of the Roman Empire (fostered by films watched in history class and TV movies like Masada), I would have really liked this book and given it four stars. But I’m 43 years old and I know too much about Roman history to be able to completely surrender to Sutcliff’s story so it only merits three stars. And only a moderately enthusiastic three. The first part of the story is “clunky,” for want of a better word. Sutcliff recreates 2nd century Roman Britain quite well but her prose style left me cold and uninvolved. It improved a bit in the latter half of the story when she recounts Marcus and Esca’s escape from the Epidaii with the Ninth’s Eagle; there were moments when I felt like I was there with them as they crossed the Scottish highlands. And realizing that this novel is geared toward the “young adult” crowd, I still could wish that Sutcliff had explored the problematic nature of the relationship between Marcus and Esca in greater depth. Marcus is the son of the man who commanded the First Cohort of the IX Hispana; Esca is the son of a Brigantian chieftain who fought that legion. The recent film adaptation, The Eagle, takes a more realistic perspective on their friendship (though not all that much better, but it is – I think – truer), especially in a scene where Marcus berates Esca for withholding information from him. I can still recommend it, however, if not strongly, to readers who enjoy this genre.